It seems like we’ve reached the end of the summer so quickly! Vacation is over and it’s time to start back to school. Let’s start with optimism and determination to have a great year! Did you know attending school regularly is essential to students gaining the academic and social skills they need to succeed? 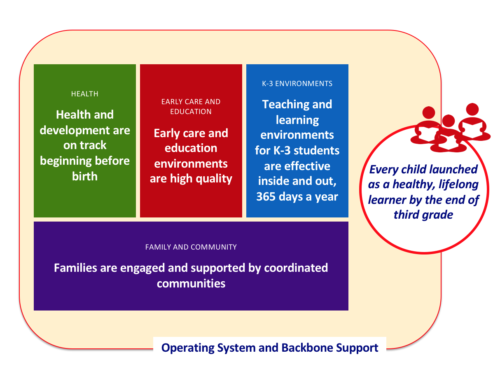 Reducing absenteeism is one of three key focus areas of the Twin Counties Read 2 Rise Campaign. The campaign supports strategies beginning at birth that put children on a pathway to grade-level reading success by the end of third grade, the single greatest predictor of future academic and career success. Why is attendance a key focus? Simply put, too many children are missing too many days from school. Chronic absenteeism is missing so much school that a student becomes at risk for academic success. It is defined as missing 10 percent or more of school for any reason (that’s just missing two days a month per school year). We often think of absences only as a problem when they are unexcused or that learning isn’t affected unless children miss a lot of days in a row. Missing two to three days every month (excused or unexcused) can add up to so much lost time that children just can’t keep up. Both Edgecombe and Nash-Rocky Mount School systems have lower average daily attendance than the state average. Both Edgecombe and Nash-Rocky Mount School systems have lower average daily attendance than surrounding districts, such as Pitt, Wilson, Halifax, Franklin and Wake County School Systems. Research tells us that students who attend school regularly have been shown to have higher levels of achievement in comparison to students who do not have regular attendance. Attendance is a critical life skill that prepares students not only for school but for life and career success. Chronic absenteeism is especially problematic among students living in poverty who are most at risk to have poor attendance over multiple years and least likely to have the resources to make up for lost time in the classroom. One of the goals of the Twin County Read 2 Rise campaign is that by the year 2020, the percentage of students scoring at or above proficiency in Nash and Edgecombe counties will increase from 39% to 50% as a direct result of students attending school on a regular basis. Support September as Attendance Awareness Month. We will introduce the Perfectly Punctual Campaign with a key message that absences add up! This chronic absence prevention program supports positive reinforcement and playfulness to encourage consistent on-time attendance. The campaign’s mascot “Punctual Pete/ Patty” will make visits to local child care centers and schools to reinforce this message. Please contact Kayla Taylor at 252-985-4300 to assist with the campaign or receive further information. Start promoting good attendance early. We can build a strong foundation and good habits if we start as early as preschool and kindergarten. Engage families. Many parents and students don’t realize how quickly early absences can add up to academic trouble. Establishing bedtime and morning routines are really important to better attendance and child well being. Focus on removing barriers. Sometimes the lack of reliable transportation is a barrier or health concerns (like dental issues and asthma) are often the leading reasons students are missing school in the early years. If you need help to improve your child’s attendance, please contact DEPC Family First line at 252-985-4300 or the counselor at your child’s school. Working together we can make a difference. Thank You to Our First Annual Golf Classic Sponsors!